Smile: you've got a free plugin. The Fletcher-Munson Curve sounds like the name of a '70s prog act, but it actually refers to set of equal-loudness contours for the human ear. 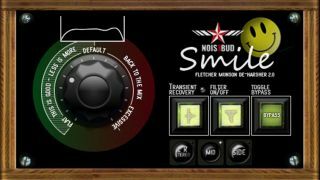 It's our understanding of said curve that's enabled Noise to create Smile, a new free Windows VST plugin that promises to reduce harshness in your music. It works by inverting the curve, while also adding transient recovery (to keep the most prominent transients around 3.5kHz) and a tube-emulated distortion for warmth. A low/high-pass filter is here, too. You can download Smile for free from the Noisebud website. If you donate you can get version 2.0, which adds mid/side processing capabilities.